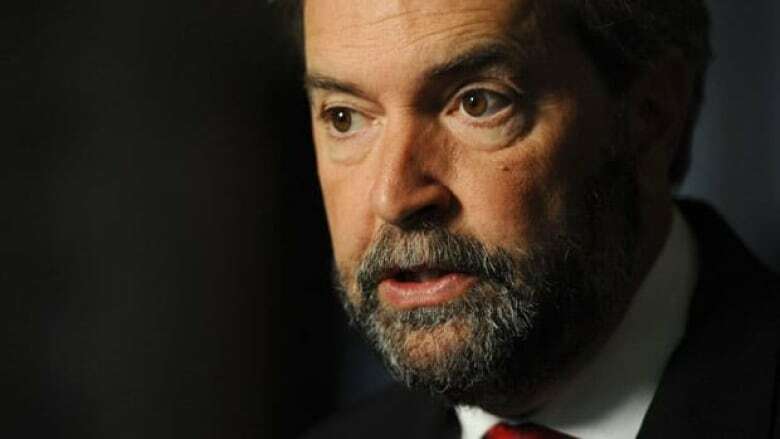 NDP leadership hopeful Thomas Mulcair says Stephen Harper's apparent disdain for Canadians who hold dual citizenship has exposed the prime minister's parochial, insular and hypocritical approach to politics. Thomas Mulcair says Stephen Harper's apparent disdain for Canadians who hold dual citizenship has exposed the prime minister's parochial, insular and hypocritical approach to politics. The NDP leadership hopeful went on the attack Tuesday after Harper appeared to question Mulcair's loyalty to Canada. Mulcair told The Canadian Press he's proud to hold both Canadian and French citizenship. Harper waded into the issue earlier Tuesday during a news conference in Quebec. "Just to be clear, these cases have come up in the past, and obviously it's for Mr. Mulcair to use his political judgment in this case," Harper said. "In my case, as I say, I'm very clear. I'm a Canadian and only a Canadian." Mulcair said Harper appears to be implying that Canadians who hold dual citizenship — some 863,000 of them, according to the 2006 census — are somehow lesser Canadians or have divided loyalties. "We celebrate our diversity, we have a minister responsible for multiculturalism. But when push comes to shove, if you give him half a chance, the real Stephen Harper comes out (suggesting) 'I'm more Canadian than you are because my family doesn't have a background in different countries,"' Mulcair said. "It's a reflection of profoundly parochial and insular thinking." Mulcair said it makes a mockery of the Harper Conservatives' intensive campaign to woo support in ethnic communities, in which many people are likely dual citizens. "I think a lot of the cultural communities who have been so assiduously courted by the Conservatives over the past six years are going to be surprised to learn that the Conservative prime minister believes that you're more Canadian if your family doesn't have a dual background." Mulcair's wife, Catherine, was born in France and is a citizen of both France and Canada, as are their two children. As the spouse of a French citizen, Mulcair, who was born in Ottawa, was entitled to apply for French citizenship himself. Mulcair said he did so 20 years ago after an unsettling incident at Spain's Madrid airport, where he was separated for 30 minutes from his wife and two then-young children because he was travelling on a Canadian passport while they had both Canadian and French passports. "Frankly, it sent a shiver down my spine not to have the same travel documents as my kids and my wife." The issue of dual citizenship has generated controversy in the past with former Liberal leader Stephane Dion and with Michaelle Jean, who gave up her French citizenship to become governor general. Jack Layton, the late NDP leader whose shoes Mulcair is hoping to fill, piled on during controversy in 2006 over Dion's dual Canadian-French citizenship. Layton said then that a party leader should "hold only Canadian citizenship" and that it's "better to remain the citizen of one country." Bob Rae, the interim Liberal leader, said Mulcair has every right to seek the NDP leadership and maintain his dual citizenship but noted the irony given Layton's attack on Dion. "I am sure the many thousands of people who hold dual citizenship will remember both the Conservatives and the NDP for their position that they are somehow less Canadian," Rae said in an email. As far as Liberals are concerned, Rae said "there are no second-class Canadians. Period." And he called on Mulcair to admit Layton was wrong about Dion. Indeed, Mulcair said he raised the issue with Layton before agreeing to come on board as his Quebec lieutenant in 2007. Mulcair said he's never hidden the fact that he's both a French and Canadian citizen. In fact, the Montreal MP has taken part in news conferences, at the request of the French government, to remind dual citizens that they're entitled to vote in French elections. His wife has actually run as a candidate for French President Nicolas Sarkozy's conservative party. Mulcair said dual citizenship has never been an issue for Quebecers, many of whom are also citizens of France. "For us, it's just a symbol of the richness of Canada." Mulcair pointed out that he fought for Canada through two referendums on Quebec independence. By contrast he recalled that Harper once co-authored an open letter urging Alberta to build a "firewall" around the province. "I have no lessons to receive about being Canadian from Stephen Harper." This is not the first time the Harper Tories have questioned a rival leader's loyalty to Canada. They launched devastating ads against former Liberal leader Michael Ignatieff, accusing him of "just visiting" because he'd worked for 30 years outside the country. Mulcair dared the Tories to try the same kind of tactic with him. "Let them bring it on," he said, predicting the tactic would backfire and send ethnic voters to the NDP. INTERACTIVE: Who will be next to lead the NDP?